Day 72 – That’s not a good look! It’s rare that I have any big problems with SL. I usually rez really fast, everything around me rezzes really fast, and I don’t lag much. But on the nights where I DO have some problems for whatever reason? Well…it’s pretty funny!! Still not having a problem moving around, though. So that’s a plus. I’ve been thinking a lot about the Big Bad Blogger Challenge. I kept meaning to run it last year but with all the RL medical issues that were going on, even when I wanted to, I just didn’t know if my schedule would allow it. But now that things here are fairly calmed down and my first trip of the year is over, I’m thinking about doing it this month. I’m wondering if there would even really be a following for it this year because it seems like most of the non-fashion bloggers have either stopped writing, or they’ve moved to just doing fashion and don’t care about writing. But it was so much fun those first 2 years! I figured it would run a little differently this time, starting on a Monday and ending on Sunday [there was some grumbles in 2010 that it wasn’t a 7 day project] and that Sunday we could have the blogger party in the afternoon so that some of the non-US bloggers could join us. The party was a mid-week thing before, back when I was running the Hump Day Parties each week, and not always easy for everyone to get to. I dunno, still just thoughts in my head, but I really would love to do it again. So we’ll see. Ugh. I’m still ugly and Aldwyn is still just body parts. I need to go take care of this! Well everyone, we did it! We reached the end of another challenge. Some people asked why it’s only 6 days. My answer is… Did you really want to write on a Saturday? :-p Except for the NZ bloggers, who did have to end on Saturday since my Sunday is their Monday. Time zones. Such silly things. Some people are continuing to go because they want to complete all 6 topics but weren’t able to post every day, and that’s cool, too! I wanted to thank all of the bloggers who participated. We ended with 97 blogs on the blogroll, which is wildly impressive to me! There were 25 bloggers in 2008, and 67 in 2009. We just keep growing as a blog community and I think that is an excellent thing. Your contributions to the SL community are outstanding as bloggers, never never think they are not. I was so happy that so many participated this year! People wrote outside of their comfort zone, they found that they DO have something to say, and they fell back in love with writing. It’s amazing to me when someone who came into this kind of just to do it comes to me and says, “I didn’t realize I had so much to say! I’m going to keep blogging!” I seriously could not ask for more than that. The blogroll will be up until tomorrow, and then left here for the rest of the year, although under my normal blogroll and of course not as expanded as it is now. The 2008 & 2009 blogrolls are also still here, but they’ll be moved around. I encourage all of you to check out all the blogs on the list at least once. There are blogs that were in the challenge this year that I had never heard of before, but I think they’ll be finding their way into my regular blog reading. We have such a blend of writers in our blog world, with so many different ideas and experiences. It’s simply wonderful. Will I do this again next year? Oh God, you bet I will. I will continue doing the challenge every June until I’m no longer a blogger. You all give me so much inspiration, I couldn’t imagine NOT doing it. Yeahhhh! Final topic! We pretty much do the same final topic each year, but honestly, I think it’s a great one. The question is the same for both the SL and the non-SL bloggers, but choose the one that is for you. If this is your first BBBC… What did you get out of your experience? Do you think it will change the way you blog in the future? If you’re a veteran…. Did you find this year to be harder or easier than previous years? Did you have fun? What did you get out of it this time around? Do you think you’d do it again? Topic #5 & a party pic! Huge thanks to everyone who came out tonight to the party! It was SO SO fun!!! Topic #5 – Blogger’s choice! Write about anything that’s on your mind! BBBC Topic #4 – What’s my age again? If you’re looking for the sign up list, it’s over here. 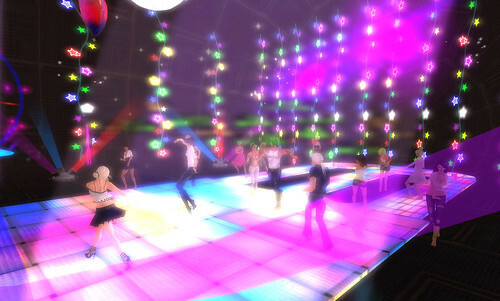 And don’t forget, tomorrow there is a Hump Day Party going on at 7pm SLT! We’ll be in the happy party ball, but there’s not really a theme. Just dress however you want and come up to have some fun. I’ll have the SLurl tomorrow, since I’m not in world at the moment to get it for you guys. SL Bloggers – Is your avatar more or less your current biological age? Do you portray a younger avatar, or older? Why is this? RL Bloggers – Do you lie about your age? Do you think you act your age? Are you where you thought you’d be at your current age?